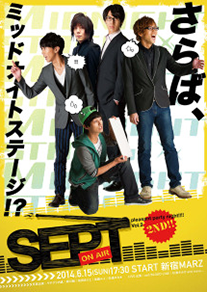 SEPT | 杉浦タカオプロデュース SEPT公式ウェブサイト » Blog Archive » SEPT pleasant party night!!!! Vol.2-2nd!! SEPT ホーム > LIVE > SEPT pleasant party night!!!! Vol.2-2nd!! SEPT pleasant party night!!!! Vol.2-2nd! !